This lovely lady was a great find for a client! 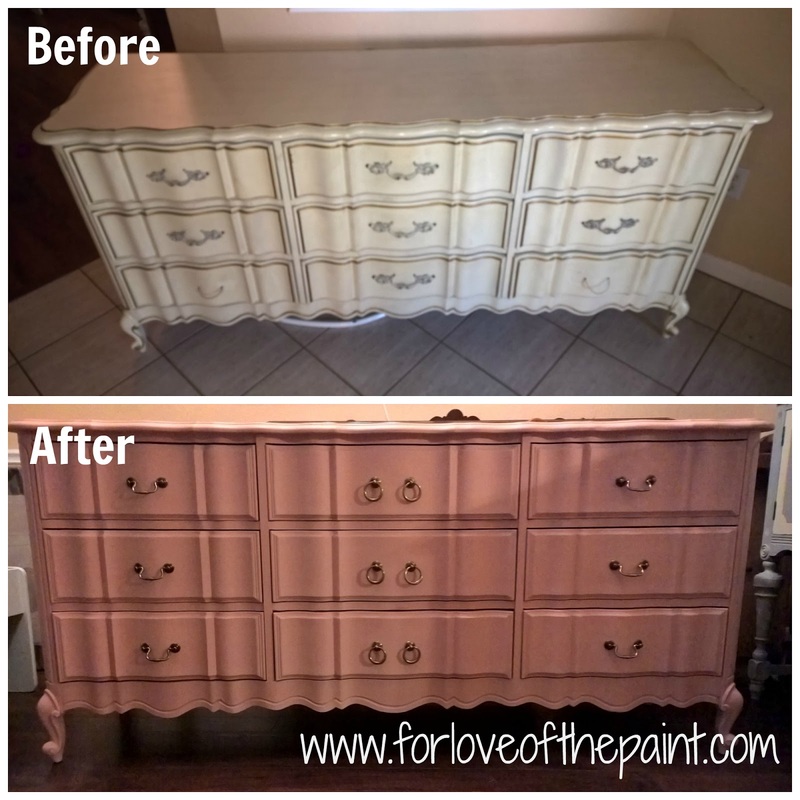 We got a beautiful French Provincial bedroom set with the 9-drawer style dresser her daughter loved, and gave it a modern, sophisticated, yet feminine redo! 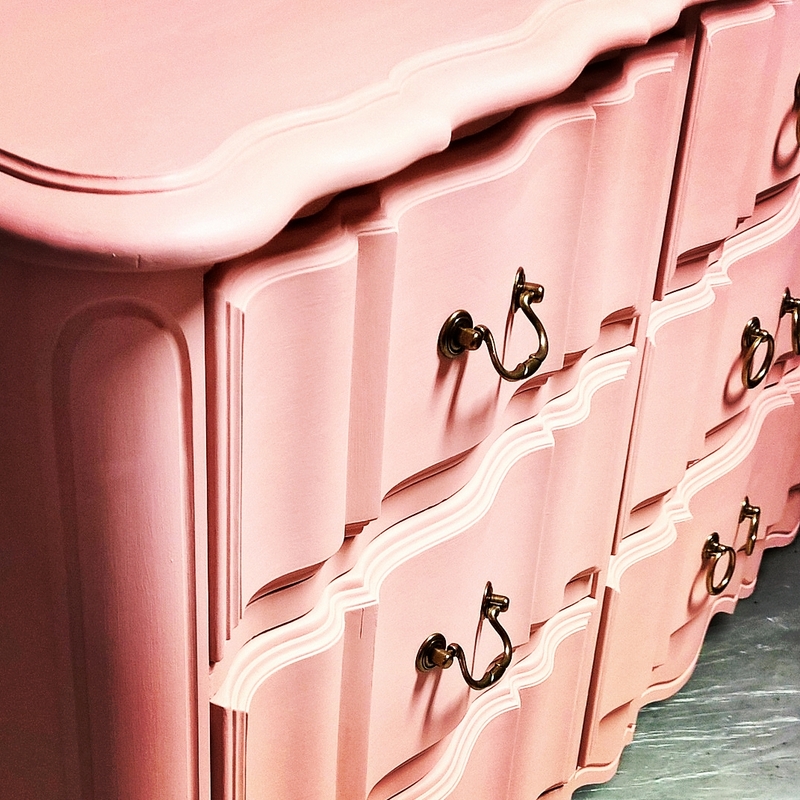 For this, they selected a custom blend of Annie Sloan Chalk Paint in Scandinavian Pink and Old White. If you're near a retailer, try to see the colors in person! There's a great store nearby here called the Weathered Cottage, which has a book of the colors blended with Old White so you can envision the great range of colors you can achieve from any given paint. Your retailer will also likely have examples of the paints with clear vs dark wax. The colors can definitely look different in person, so I highly recommend you look for the retailer nearest you, and give them an in-person visit! The second consideration on this great vintage piece was the handles. There was one piece of hardware missing, so the first option would have been to look for an exact replacement. However, due to the beautiful curvature of the drawer faces, the original hardware actually made it a little difficult to grasp the handles - since both the drawer faces and the handles were curved in the same direction, there was a limited amount of space in which to grasp with fingertips. So, we found these great bail-style pulls as an option that gave a great vintage color, yet modern feel, and dropped away from the drawer fronts in a manner to give more sufficient manner. Aren't they gorgeous? And super usable and accessible. Simply lovely! Scandinavian pink is a gorgeous, mature pink with coral undertones. In this case, we used a matte polyurethane for a gorgeous finish. UPDATE: This gorgeous dresser now has a sibling! Check out the corresponding vanity by clicking here!